Watching the parliamentary fallout of the Brexit vote, which can be read as a disaster of its own making or accidental proof of democracy reasserting itself in London, I wondered what was happening in our fair city during the same year in other centuries. We can take it as read that there were riots and protests – there usually are – but what was actually being created for Londoners? Let’s take a look. With the war over, London turned its attention inwards. The London County Council planned the Beacontree Estate, a giant circular garden town in a single inalterable plan that moved thousands from the East End. To people who had never had front and back gardens or inside toilets it was a miracle, but because it had not evolved it remained spiritually dead, ugly and depressing. As it is now, by all accounts. Oh, and the Hammersmith Palais was built. Hurrah! Piccadilly Circus was created! It was originally a crossroads and now became a crescent, but when Shaftesbury Avenue joined it in the 1880s the formal shape vanished altogether. The Burlington Arcade was also constructed in this year. The Angel Inn at Islington was demolished – the inn with its double-galleried courtyard was a stop for cattle dealers heading to Smithfield, and was replaced by a pub, still there. Dr Johnson’s house burned down, and the first villa was built in Regent’s Park, but everyone thought it was horrible. A few months later, Regent’s Canal opened. The Richmond Theatre was built out of an old donkey house and opened. Lanesborough House was built for Viscount Lanesborough, who put over the door, ‘Tis my delight thus to be Both in the town and country.’ The Huguenots rioted over in Spittalfields, and anyone caught wearing cheap Indian calico had ink thrown over them. The Whitehall Banqueting House burned down (because wood) and for reasons unknown (hem hem) King James and his favourite George Villiers slept together in the Chicken House on Hampstead High Street, which is still supposed to have commemorative glass portraits of the couple. Fashion was moving away from wood panelled rooms to tapestries, and to save importing them from the Continent, tapestry factories were built in Mortlake. The Prospect of Whitby pub was under construction and opened the following year. But it was called the Devil’s Tavern then, and only changed its name in 1777 when a ship called the Prospect moored there. And the hall of the Embroiderers’ Company guild was built in Gutter Lane, where it remained until the Blitz. Plays were banned in the city at Christmas, the Ludgate Prison was closed and its prisoners moved to the more horrid Newgate, partly because poor families had quite liked living there. People tend to cark it in Newgate because of the appalling conditions. By now, there were 280 breweries in the city. Communal drinking had arrived (if it hadn’t already been there before). 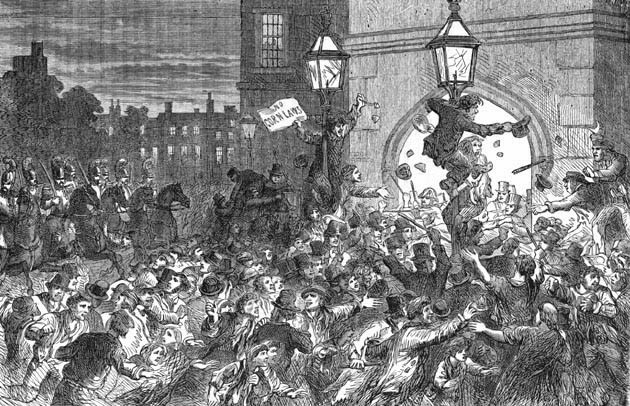 Drought and famine finally reached London from the shires, and ended in a massive thunderstorm that damaged both the Holborn and Fleet Bridges. 300 oak trees were cut down to repair Barking Abbey, and the pillory came in to punish errant Londoners. A butcher accused of selling putrid meat was found guilty and had his carcasses burned underneath him. We were stropping the French around about now, with a major battle at Lincoln. London, where strong opinions were backed by wealth, supported the Frogs rather than Henry III. Paternoster, the church and the lane, turn up at this time – ‘paternosters’ being rosaries – and the Barking Market was set up by the Abbess whose descendent later cut down a forest to repair her abbey. Information is getting scarce now but we know that during the previous year the Knights Templar became established in Holborn. Two centuries later the influence and wealth of these pilgrim protectors would destroy them, pride goeth-ing before a fall. A church – St Antholin’s – went up on Watling Street, and preparations were made to build the first guildhall. Beyond this point we start to descend into the Dark Ages, where information is scant but still being unearthed, so 1019 to 419 – some Anglo Saxons grubbing about, London walled but decrepit, most folk preferring to live outside in villages, and 419 to 19 (or rather, 54BC) the Italians bringing us all the things we didn’t want, like central heating, roads, democracy and London. What do we learn from all this? That guilds, pubs and churches remain a constant throughout London history, that the people of London think themselves separate from the nation and remain rowdy and independent. What will we take away from the year 2019 in terms of improvement? Some more multinational skyscrapers, courtesy of Legacy Bojo, and not much else. The Italians also brought running water and the concept of bathing–other things the natives didn’t much like. Not sure the Italians brought you democracy since they didn’t have it, certainly not suffrage. Observing the number of not-quite-correct auto corrections in this post, I think the writer had a late night/early morning. Brooke, Bathing in the sense of cleansing with something vaguely like soap and water goes further back than the Romans. However, the ‘soap’ used was more likely oil mixed with other stuff and the whole lot had to be rubbed in and scraped off. Something close to modern soap was first produced in useful quantities in the 18C in the English Black Country (like many good things). Of course, the gov put a tax on it to limit its use to the higher echelon … . Blimey Brooke, I counted 2 spelling mistakes but the rest stands – not bad for 5:00am! (I don’t use Spellcheck because in a sneaky bit of stealth invasion it auto-resets to American and drives me crazy). No criticism intended, Mr. Fowler. Peter T–I think if I lived in 18c Black Country I would ave to invent soap–no offense intended. Brooke, none taken. Interestingly, soap manufacture began before the massive industrialisation. Perhaps, the availability of soap allowed the refined (!??!) Black Countryman to develop the heavy industry that made the area workshop to the world? This wouldn’t have been a problem if people still had a ready source of wood, but that had started to disappear as well, consumed by industry and turned over to arable crops; a growing population had to be fed. The tax would last over a century, levied by weight, so the poor man buying coarse lye soap paid exactly the same tax as the rich man did for imported luxury soap. Saponaria officianalis. A useful plant, that if you need to wash your hands, and find some growing near a stream, just pick a load, break the stems, and scrunch it up in the water. You can use the stems like a sponge, and as the water meets the sap, a soapy fluid that doesn’t smell of much, but is quite effective at cleaning stickiness and dirt off is released. That’s how I have used it, when out on my bike. If you have more time, gather the leaves, bruise them, and soak in water, to release the active ingredient, Saponin. The resulting fluid can be used as soap. I had a (great) aunt that lived on the Beacontree. I dimly remember some family furore when my parents took us to visit. My (never met) (great) uncle had been a master baker and they had moved out there, but she was still meant to come to Lambeth for family occasions – no one was meant to go to her. No one was meant to come to us either. That all changed when my cartoon whatever-grand-grandma finally died very old, my grandma very young, and then my granda moved in with us. Much later a friend lived up there, and it took me ages to work out why I’d been thereabouts before.